On Sale Now! Save 3% on the The Lakeside Collection Raised Garden Bed Set by The Lakeside Collection at Tulips Orchids. MPN: 4316322158. Hurry! Limited time offer. Offer valid only while supplies last. Take gardening to the next level with the Raised Garden Bed Set. It's perfect for those who want to build a garden in a separate area of their yard. 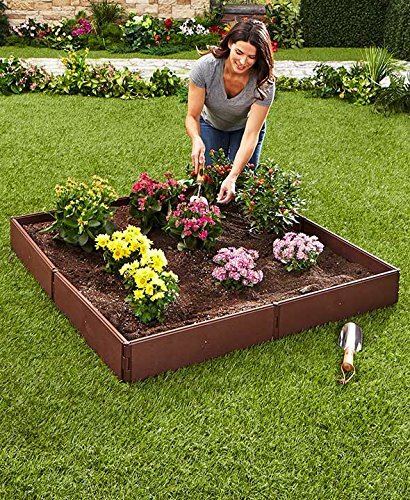 Take gardening to the next level with the Raised Garden Bed Set. It's perfect for those who want to build a garden in a separate area of their yard. Can be built as 1 large shape or split into 2 smaller shapes. There are 8 stakes that slide between the panels and secure the entire frame to the ground. Multiple sets can be put together to create a different configuration. They can also be stacked vertically to make it higher. 45-3/8" sq. x 5-5/8"H, overall as a big square. Polypropylene. Easy assembly required.